I’m still laughing at myself for hitting ‘Publish’ instead of ‘Save Draft’ on this post the other day — oops!! The Brit and I knew from the start that we wanted to have a destination wedding. We wanted to find a balance and a sort of ‘neutral territory’ between our two countries, and although the Caribbean is closer to the US, we knew we wanted a warm destination so it seemed like the best choice. 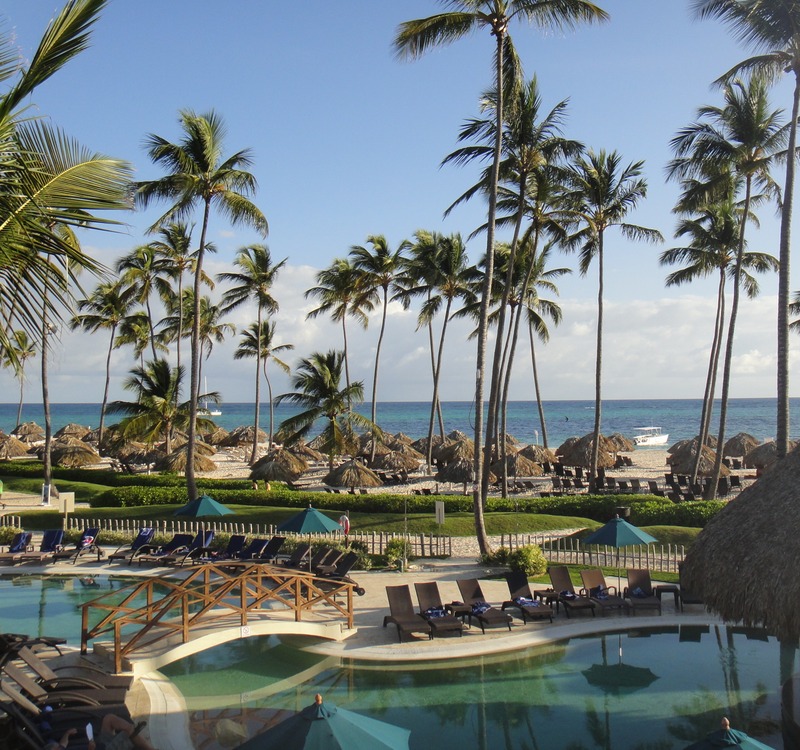 After two weeks of debate and scouring the internet for resorts and locations that suited our styles, we finally decided on a resort in the Dominican Republic called Now Larimar. One thing with destination weddings is you aren’t always so lucky to visit your resort prior to making a decision, so we chose Now Larimar based on the website, the advice of a travel agent we were using in the States, and online reviews. (Although I later came to realize that TripAdvisor can sometimes be your worst enemy having worked myself into a tizzy a few times about things I read, so I had to stop myself from reading reviews.) We were able to visit the resort a month before the wedding because we were in the DR for my cousin’s wedding, so that made the last month incredibly easy as we knew exactly what details needed our attention and what decor we still had to purchase. Our room was on the second floor on the far left. I want to go back. Because this trip was not just any old holiday but our wedding, we splurged on the Preferred Club Ocean Front Master Suite. It was a great decision! We had plenty of room for all of the wedding things we brought with us with a living/dining room, two bathrooms (one of which was the size of the entire downstairs of our house and I am not exaggerating), a wonderful bedroom, and a stunning balcony boasting a hot tub and an outdoor shower that allowed us to wake up to this view every morning…. The Brit and I left for Punta Cana on Christmas Eve, so we actually spent Christmas Day there. This was the first time both of us were somewhere warm for Christmas, which was weird but incredible all at the same time. (I mean, we saw Santa arrive on the beach in a helicopter!) We were both so excited to be in the sun again and definitely made the most out of our time by the pool. A friend of mine was also there with us beginning on Christmas Eve, so the three of us amused ourselves by making trips to the swim-up bar, soaking up the sun, taking walks on the beach, and tearing up the floor at the disco at night! It was really great! 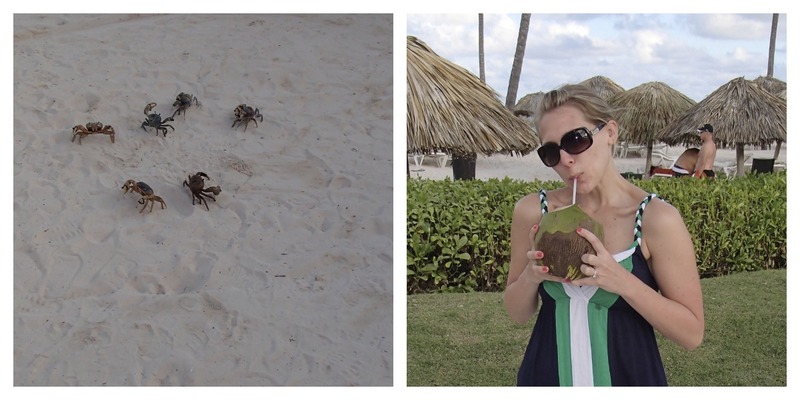 We also watched a crab race and drank from coconuts. All funny touristy things that we had a good laugh about! The Brit and I did have some wedding errands to complete (for example, assembling welcome bags for our guests and our centerpieces) and we had some loose ends to tie up with our wedding coordinator, so we took care of those things as well. 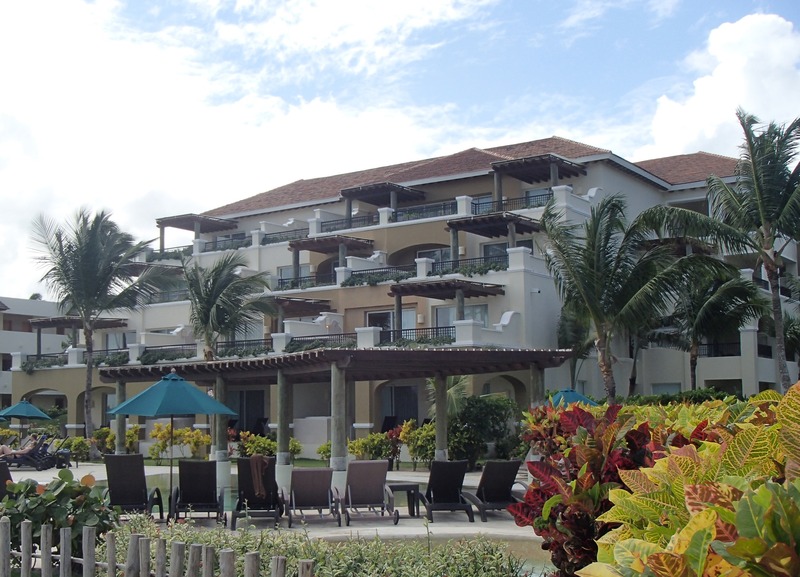 One advantage of having the wedding at an all-inclusive resort is that most have their own wedding department, which means they take care of everything from the flowers to the food to the entertainment for your wedding day. We were assigned our own wedding coordinator when we first put our deposit down in early 2012 and she was our contact at the resort throughout the whole planning process. I feel we really lucked out with our coordinator, Silvia, as she was extremely kind with some of our crazy requests and had some great ideas that she thought would suit our tastes. 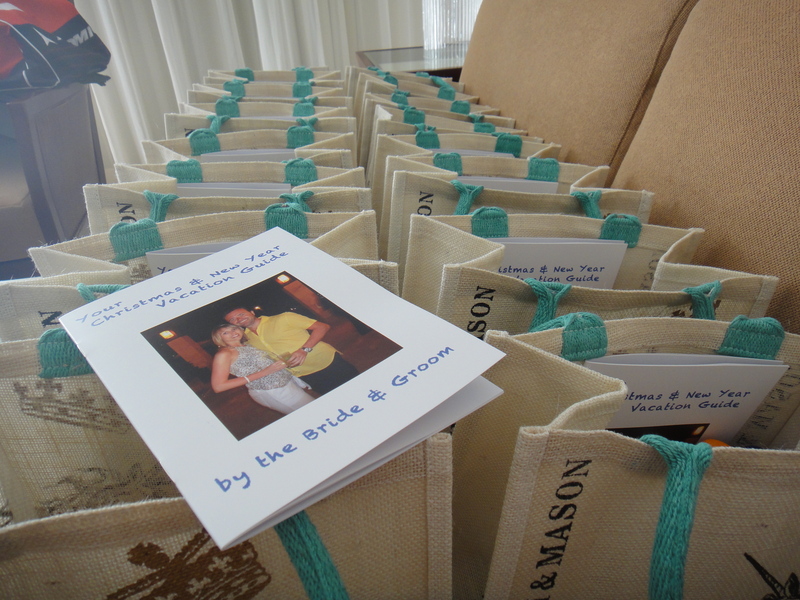 The welcome bags and booklets we made for our guests. The booklets were a BIG surprise to our guests. I’m so glad the Brit came up with this idea because our hard work on them paid off with everyone loving them! The whirlwind began on the evening of December 26th when more guests began to arrive. It was so exciting and fun to see everyone in a warm and relaxed environment! Our friends and family were there to celebrate with us and they all came with the best attitude of just wanting to have fun! It was really amazing! Our Thursday night dinner crew — we have some AMAZING friends! It was also on this day when a storm decided to sweep through the midwest and the northeast of the US, which is of course where nearly all of our US guests live. It’s so funny looking back on it now because I had some tears the morning of the 27th when my parents’ flight was cancelled, but then I just moved on with it because they were rescheduled on a flight for Friday (which ended up being cancelled too and the woman at United got them re-booked with US Airways when my mom explained her daughter was getting married the next day — thank you, United woman!!). Soon after, we found out my aunt and uncle’s flight as well as the flight of one of my bridesmaids and her fiancé were also cancelled, and it didn’t appear they would make it at all. Ha! Still, I was oddly calm. I think I knew it would all work out. And, it did because they all ended up arriving on Friday! The best part of this is we had no idea my bridesmaid was able to reschedule her flight, so we just happened into the lobby and who comes running at me?! Jessi! I would have loved for someone to have captured a photo of that moment because I didn’t know what to do, and my eyes couldn’t believe what I was seeing. All I could say over and over again was, “I can’t believe it. I can’t believe it.” I then remembered I had cancelled their dinners and her bouquet, so the Brit took over and ran to the wedding coordinator’s office and added them back on — no problem at all! That excitement was soon followed by the arrival of my parents, my brother and sister-in-law, and my aunt and uncle. 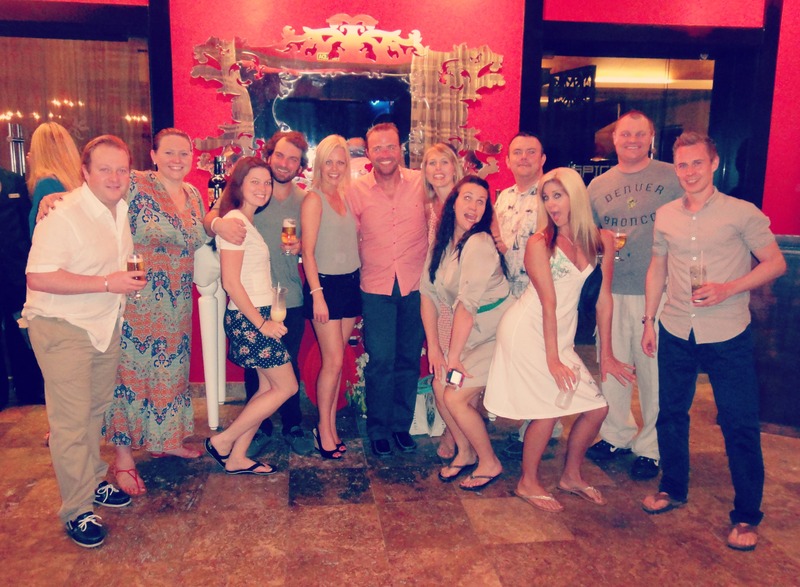 Everyone had made it and it was time for the fun to continue with our own take on the rehearsal dinner! How did I miss this post?? Anyway, I am drooling over that view- amazing! I’m so glad everyone was able to make it in the end. It’s funny, though, you and I seem to have the same last-minute stress response. The power at our venue went out the morning of our wedding, and was still out 1 hour prior- and I was completely “eh, whatever” about it! Seeing everyone’s shocked faces at my response only made the situation funny, really! Can’t wait to read the rest! I think because I accidentally posted it before it was ready and then deleted it that it didn’t show up again in Reader! Oh well. Ah, it was fab! Seriously, I even surprised myself with my all-too-calm reaction. I like that you were similar on your wedding day though. I mean it all worked out, so no biggie, right?! I’ve read this publish and if I may just I wish to suggest you few attention-grabbing things or suggestions. Maybe you could write subsequent articles relating to this article. I desire to read even more things about it!